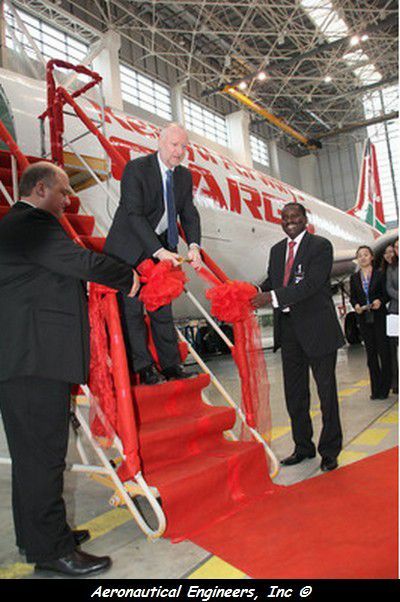 Kenya Airways Cargo has just taken delivery of its first B737-300 Cargo (thanks African Aviation Tribune) in Shangai. It is the first of four B737s Cargo that the airline will operate. Kenya Airways Cargo is using a cargo aircraft, a B747 leased from Martinair Cargo. During the ceremony, the Kenya Airways's management team, has announced that Kigali (Rwanda) will be among the first destinations served by the freighter aircraft. Currently there are two Cargo airlines, which operate flights between Kigali and Nairobi. A Kenya based airline, Astral Aviation and Martinair Cargo which operates flights on behalf with KLM Cargo. Ten years ago, Kenya Airways launched a Cargo airline, but the airline has quickly ceased flights. Kenya Airways Cargo wants mainly to compete with Ethiopian Airlines Cargo, which is currently the biggest African Cargo airline with a fleet of 6 aircraft. In 1984, the 737-300 replaced the B737-200. This was a much quieter, larger and more economical aircraft and contained a host of new features and improvements. In may 2002, 3 years after the roll out of the last B737 Classic (B737-300 / 400 / 500), Pemco Aviation Group announces that it has inducted its first aircraft for the new 737-300 cargo conversion program at its Dothan, Alabama facility.